Welcome to Udaipur - contd. A majestic architectural marvel towering over the lake on a hill surrounded by crenallated walls, it is a conglomeration of courtyards,pavilions,terraces,corridors,rooms and hanging gardens. The main entrance is through the triple arched gate, the ‘Tripolia’with eight marble porticos. The Maharana were weighed under the gate in the gold,the equivalent amount of which was distributed among the populace. The Suraj Gokhada, the balcony of the sun, is where the Suryavanshi Maharanas of Mewar presented themselves to the people in time of trouble to restore their confidence. The ‘Mor Chowk’ known for its exquisite peacock mosaics in glass and the ‘Chini Chitrashala’noted for its blue and white ceramics are other attractions in the palace. Built in 1651 A.D. By Maharana Jagat Singh, this Indo-Aryan temple is the largest and the most beautiful temple of Udaipur with noteworthy sculpted images. The interesting collection exhibited by this Indian folk arts museum includes folk dresses,ornaments,puppets,masks,dolls,folk musical instruments, folk deities and paintings. This small ornamental garden was a popular relaxing spot where royal ladies came for a stroll and hence the name. The garden has many fountains in its four delightful pools,chiseled kiosks and marble elephants. Atop the Moti Magri or pearl hill,overlooking the Fateh Sagar Lake is the memorial of the Rajput hero Maharana Pratap with a bronze statue of the Maharana. A beautiful lake,overlooked by a number of hills on the three sides and the Pratap Memorial on the north was built by Maharana Fateh Singh. In the middle of the lake is Nehru Park-a lovely garden island with a boat shaped café accessible by an enjoyable boat ride. The picturesque lake that entranced Maharaja Udai Singh. It was later enlarged by the founder. The lake is surrounded by hills,palaces,temples,bathing ghats and embankments. 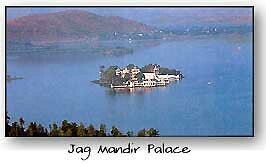 Two island palaces,Jag Mandir and Jag Niwas(Lake Palace) on the lake are of breathtaking magnificence. The ancient capital of Sisodias, 3 km from Udaipur,Ahar boasts of a profusion of royal cenotaphs of the rulers of Mewar. A rare collection of antiquities including earthen pots, iron objects and other art items excavated in the region are displayed in a small Govt. museum. Dominating the city’s skyline is the monsoon palace of Sajjangarh.It offers a panoramic overview of the city’s lakes,palaces and the surrounding countryside. A spectacular rose garden laid out by Maharana Sajjan Singh. A library in the garden has a rare collection of ancient handwritten manuscripts and books. Eklingji (22 km): Built in 734 A.D. is the beautifully sculpted temple complex with 108 temples within its high walls. The temples are dedicated to Lord Shiva, the presiding deity of Mewar rulers. The walled complex encloses and elaborately pillared hall or ‘mandap’ under a large pyramidal roof and has four-faced image of Lord Shiva in black marble. Nagda (23 km): The ancient site dating back to the 6th century A.D. is renowned for the Sas-Bahu temples (9t - 10th century A.D.) with interesting architecture and carvings. The splendid Jain temples of Adbudji are also worth a visit. Haldighati (40 km): A historical site, witness to the great battle fought between Maharana Pratap and Mughal Emperor Akbar in 1576 A.D. The Chhatri of Maharana’s horse-Chetak is noteworthy. Nathdwara (48 km): The most reverred 17th century shrine, dedicated Shrinathji or Lord Krishna,attracts thousands of Pilgrims from all over the country,especially during Diwali, Holi and Janmashtami when their number exceeds a lak. Foreign tourists are not permitted inside and photographs is prohibited. Kankroli (65 km): An important vaishnava temple popularly called Dwarikadish. It is the most important temple of the Vallabhacharya sect,built to resemble the famous Nathdwara shrine. Rajsamand Lake (66 km): Close to Kankroli is the dam built by Maharana Raj Singh in 1660 A.D. Many ornamental arches and chhatris adorn the embankment. Kumbhalgarh Fort ( 84 km): The second principal fortress in Rajasthan after Chittaurgarh, it is perched atop the Aravallis.Built in the 15th century by Maharana Kumbha, it extends over 12 km and enclose many temples,palaces and gardens.The fort renovated in the 19th century. The Badal Mahal or Cloud Palace offers a spectacular bird’s eye view of the surrounding countryside. Closeby is the Kumbhalgarh Wildlife Sanctuary with a rich variety of wildlife. The Fort is accessible only by jeep from Kelwara through the seven gates. Jagat (58 km): The splendid and well preserved 10th century temple of Ambika Mata is known for its intricate carvings in the outer walls. Popularly known as the Khajuraho of Rajasthan. Jaisamand Lake (48 km): A stunningly situated artificial lake, built in the 17th century A.D. by Maharana Jai Singh is the second largest in Asia. Graceful marble chhatris flank the embankment and beautiful summer palaces of the Udaipur queens are built on either side of the lake. Jaisamand Island Resort is also worth visiting. A trip to Jaisamand Wildlife Sanctuary allows a close encounter with the rich wildlife in their natural habitat. The fauna includes panther,wild boar,deer,four honed antelope, mongoose and various species of migratory birds. Ranakpur (90 km): The beautifully sculptured Jain temples lie in a tranquil valley of the Aravallis. The main ‘Chaumukha Temple’ is dedicated to the tirthankara Adinath and has 29 halls supported by 1444 pillars, all distinctly carved. Two jain temples dedicated to Neminath and Parsvanath and a Sun Temple a little distance away ,are also noteworthy.